← Hammerknight Recipe 4: Gun that hog! Sorry, but that looks more like a mini Chun-Li from Street Fighter. And as MiniMidget slowly reaches underneath Ms. Ritty’s teeny kimono with his remaining super micro-arm… mission accomplished! @Bael: That’s what got me, too — what’s so super about a guy who can’t handle a freaking RAT TRAP?! For that matter, at his scale (from what I can tell), the trap must have been the size of a dining table. How did he miss (or rather not miss) it? The guy in the picture isn’t minimidget. And the woman is m.m.’s equally tiny wife. M.M. is the same size as her, and therefore CAN be caught in a regular-sized rat-trap. But he would have to be one hell of an idiot to do that…. Mini midget is lying in bed, after his harrowing encounter with the mousetrap. And yes, he was that stupid. The other girl is Ritty (I think that’s her name) and it’s his girlfriend. 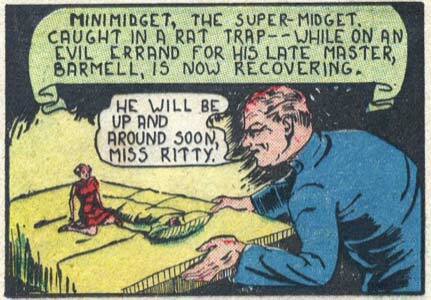 I don’t think they ever explained how she got to be a mini-midget, it was just a random encounter when they met. And I don’t know why HE is “super” while SHE is not, although as far as I can tell the only thing “super” about him is that he’s got super-fragility.